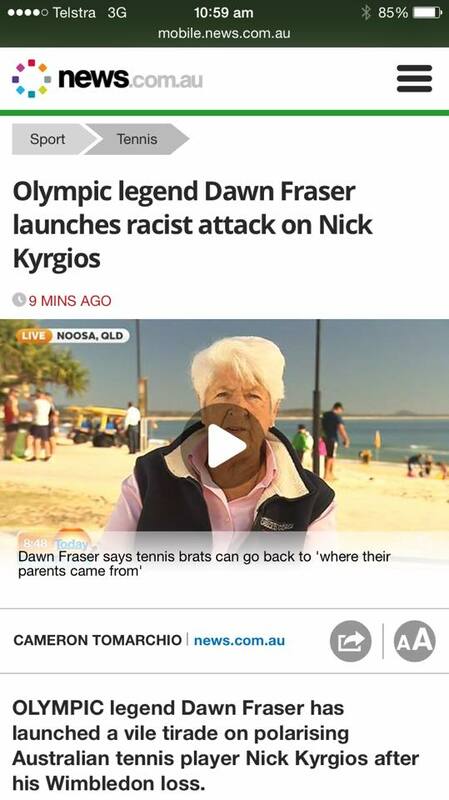 Australian swimming legend Dawn Fraser has apologised after suggesting Nick Kyrgios "go back to where [his] parents came from" over claims he was tanking during his fourth-round Wimbledon loss overnight. The Canberra-born Kyrgios, who is of Greek and Malaysian heritage, made no effort to return serve in the third game of the second set of his four-set loss to 21st seed Richard Gasquet on Monday night (AEST). To see Dawn's video click here. Throwing a racket, brat. Debating the rules, disrespectful. Frustrated when competing, spoilt. Showing emotion, arrogant.